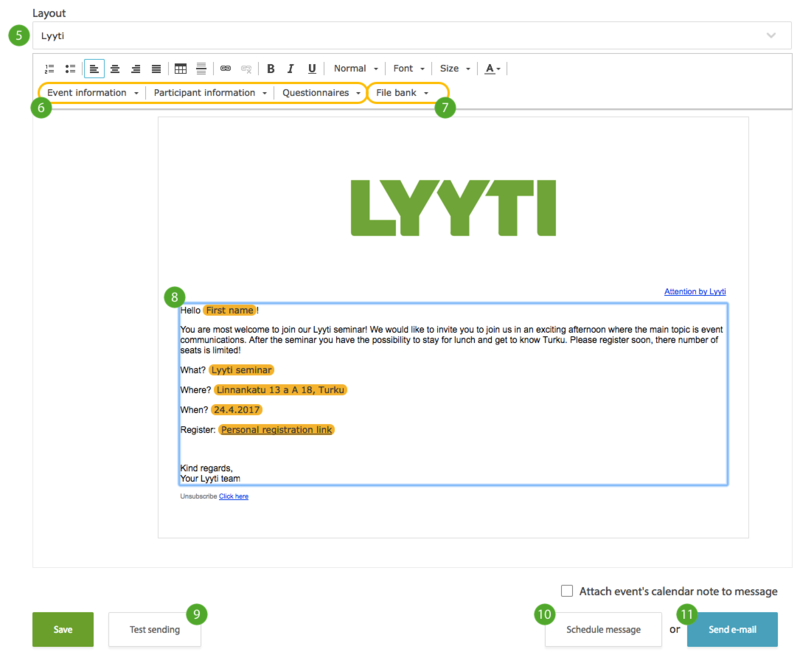 E-mails sent from Lyyti can be invitations, reminders, thank-you messages or questionnaires - whatever it is you need to communicate to the event's participants! With Lyyti you can easily personalise the message to the whole group of recipients or narrow down the list of recipients based on participant status or a specific answer. Create a new e-mail by clicking Communication in the left menu, and then Create e-mail. 2. Under Settings you can change the sender or reply-to details and write down an internal note of the message content. The note will not show to the recipient, only to you as the organiser. 3. Choose the recipients. Click the Message recipient(s) field and choose your recipients, either by filtering (e.g. registered participants) or by choosing one by one. Learn how to select participants. 4. Give a subject to your message. These next steps have to do with the message contents and sending. 5. Choose a layout for your message. You can see how the message looks already at this stage. If you want a completely new layout, you need to start by adding it in My layouts (please see instructions here). 6. You can personalize the message with ready-made personalizing codes. Lyyti creates these automatically according to information regarding the event, the participants and the questionnaires. Click the Event information, Participant information or Questionnaires menus in order to choose the desired personalizing code. The codes are first shown as eg. "First name" on a yellow background, but when the message is sent out the codes will show the accurate information. 7. You can also add attachments straight to the message, the same way you choose the personalisation codes (6). If you want to hide the attachment in the text as a hyperlink, just bold the word in question and choose the desired file from the File bank menu. 9. Do a test sending. Here you can choose the participant information you want to add to the message and to which e-mail address you want to send it. This way you'll see exactly how the message will look to the receiver. The test sending doesn't affect the sending statistics and also doesn't lock the message like a normal e-mail. Therefore we strongly recommend that you use this function! 10. Schedule your message or 11. send it straight away.